Before the winter winds hit us, autumn breeze spoils us with crystal clear air and sunny weather that is made to spend some time outside. So before you huddle up on your couch with a cup of tea and get ready for winter, why not go out and explore the beautiful city of Prague? The perfect excuse to do so are three magnificent festivals that will surely lift your spirits and make you love autumn in the city! No matter if it’s extraordinary light shows, coffee or unknown movies that make your heart beat faster – October surely holds something in store for you. It’s that time of the year again! 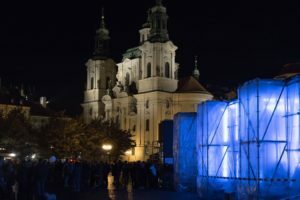 From 11th – 14th October 2018, SIGNAL festival will light up the sky above Prague and motivate thousands of people to pilgrim around the city, looking for the most fascinating show of the year. 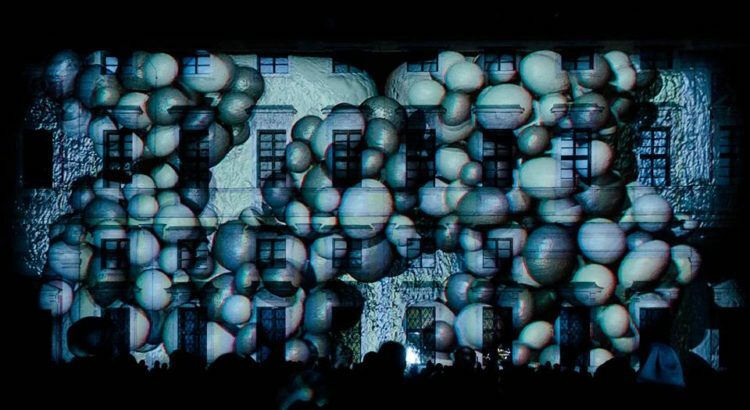 Signal festival, first held in 2013, is the largest cultural event in Czech Republic that combines art, the city and modern technology in a fantastic and captivating way. The festival of lights already counts over 2 million delighted visitors in its five year long existence – and is keen to fascinate more each and every year. 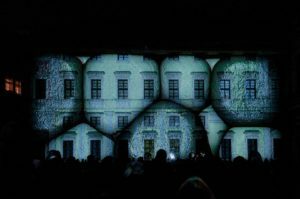 SIGNAL’s projecting digital art onto ancient buildings has reached international attention and is a well sought-after platform for artists wanting to present their newest pieces on this field. SIGNAL is bound to give you four nights of marveling and takes you on a journey through an illuminated Prague. Imagine a life in a fixed, small space – a cold, dark place in which fluorescent lights blind your eyes and you do not even remember what daylight is. OBRAZ is bringing this terrifying and yet important experience to visitors on this year’s SIGNAL festival. Dare you enter one of the cages, where lightbulbs -some of them broken and/or damaged – are hovering over your head? The narrow space is accompanied by the nervous and panicked – original – sounds of a farm. OBRAZ is trying to raise awareness of the miserable lives of laying hens – right on time for World Egg Day (12th October 2018). Experience the darker sides of our modern society with the help of this creative installation. Ready to ‘gate’ away? A light bridge connecting a tram stop with the National Technical Library and the Faculty of Architecture are bound to take you away into another world. With every visitor entering, different parts lighten up, showing them the way like fireflies in the night sky. Experience Dejvice like you never have before in this magical place! Are you a history freak? 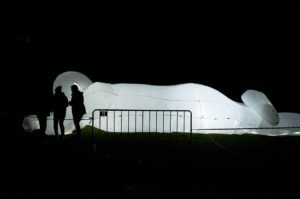 Then ‘Memory of the Nation’ is your go to installation this SIGNAL festival. With short videos of authentic testimonies, material of the Battle of Britain, death transports and interrogations in the State Security cells. This installations is bound to give you the chills and is telling the dark tale of two totalitarian periods. The talented team of artists chose a very fitting spot for their presentation: ‘Memory of the Nation’ is located where once the Stalin monument used to tower – and a little out of the way if you wanna skip the crowds. Get ‘enlightened’ and discover the many more fantastic works of art and where to find them right here. Wind and weather, scarfs around our necks and coats covering our shivering bodies: Cinema season is here and with it an excellent movie festival: Kolnoa 2018 is bringing Israelite masterpieces to Prague! A week full of unique films awaits you and we got all the information you need for a successful cinematic experience and kick-off into cinema season. Kolnoa – the name of the festival inspired be the hebrew word for cinematography – was first established and organised by the association ‘KOLNOA CZ z.s.’ in 2017. The goal of the creative minds behind the scenes? To bring unique and lesser known work of the cinematography world to Prague. With that, they are opening the doors for cinemagoers to see more of the captivating, colorful land full of contrasts. During the festival, you get to experience movies (either in English or with English subtitles) that are usually not making its way to Prague – or even to into Czech film industry. An assortment of both newly released and old classics, featured and documentary productions: This is Kolnoa festival. Furthermore, one gets to peak behind the scenes and can join lectures, find out more about Israeli film schools and can join dance, music, art and – unexpectedly so – culinary craft programs. 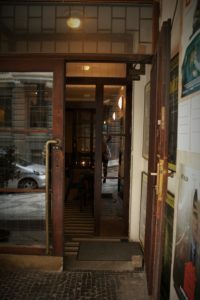 Kolnoa conveys values of a country that is interesting, diverse and full of life. Various cinemas are participating in this year’s Kolnoa Film Festival and are inviting you to dive into the talented works of Israeli film makers and more. 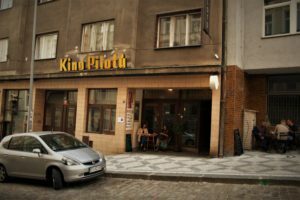 Kino Pilotůon Donská Street is hosting the widest span of films presented during the festival – some of them being screened even more than once if you miss the first screening. Kino 35‘s screen, located in Prague 1, will light up 5 times, broadcasting wonderful pieces of art throughout the week. Lucerna hosts the screening of the movie ‘Virgins’ on its premises in Old Town. Thomas travels to the birthplace of the man that his heart belongs to. The occasion is rather dark: Oran has passed away. Despite the prejudice of the Israeli people towards his German origins, he manages to become the pastry chef of a local café. The owner of the place? The widow of the deceased Oran, who doesn’t suspect any connection between her and the stranger. Ever had an accidental encounter? These two protagonists accidentally meet an airport, him mistakenly assuming her to be his driver. She however does not bother to correct him – too exciting is the random encounter. ‘Aya’ is a poetic movie starring a phenomenal cast. A mermaid spotted near shore; this is the rumor that makes a young journalist show up in the life of teenaged Lana, who is fed up with her hometown and her mother’s unsuccessful beach café. His arrival turns her life around, never to be the same again. A touching movie with poetic images that brings us back to memories of our own adolescence, rebellion and vulnerability. Explore more of the fascinating movies shown at Kolnoa festival right here and get detailed times. Keen to know more about this cultural and vibrant festival? Check out Kolnoa’s official website right here. 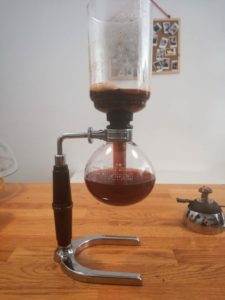 The copper colored fluid of productivity and life: Coffee has accompanied mankind through many workdays, cured many lacks of sleep and woke up our body system for many years. Today, Prague is full of specialty coffee shops where one can get the perfect cup for every mood. What if we told you that this October, you can get all the variety of coffee shops of Prague and beyond in one place? 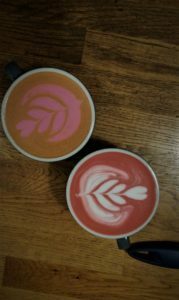 It’s Coffee Festival in Prague! First established in 2012, Prague Coffee Festival aims to introduce you to the world of coffee – and its newest gems. Held yearly on Prague Markets area, this is the place where big names such as ‘Casino Mocca’ and ‘Fjord Coffee’ come together and you get to chat to them about planting, harvesting and roasting the perfect cup. It is exactly this aspect, that made the minds behind Prague Coffee Festival organise the same: Bringing everybody that is interested in coffee and keen to experiment with the various processes that the specialty coffee scene has introduced to the market, together. Be it professional baristas, coffee shop owners and coffee ‘newbies’, Prague Coffee Festival invites everyone to come along on a journey of learning new and exciting things about the gold of the green, red and eventually brown bean. 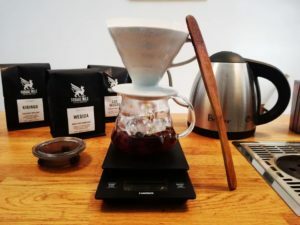 Learn how your coffee gets from the field into your cup, about the many ways of brewing and what distinguishes specialty coffee from ‘regular’ one and sip great coffee from the various brew and espresso bars around. Because one learns better with all 5 senses, the festival is not short of cuppings, coffee shop and roastery presentations, workshops, lectures and of course: A music program. To make sure that you will be able to hit a spot at these fabulous workshops, sign up right here! Prague Coffee Festival: Perfect for coffee pros, beginners and all those who are fond of the copper colored liquid. Stay caffeinated! Have you made up your mind to which festival the wind will take you this October? Why not visit all of them and get a whiff of just how diverse, interesting and fascinating Prague can be. Happy exploring! FREE UBER Uber taxi works perfectly in Prague and you can ride for free with code "PRAGUEGO". AIRPORT TRANSFER Get a private transfer from/to Prague Airport for a price of regular taxi (€22). OUR TIP Make your stay unforgettable with adventure experiences and adrenaline activities.